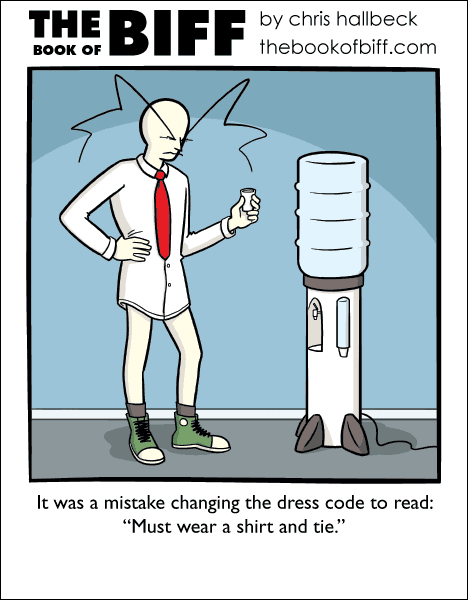 I’ve worked at a few places that had dress codes. Probably the most frustrating one was when I was there for the inception of that companies code. The main issue was that it was a company wide punishment for the crazy clothing of a single employee. She was fired a few weeks later but everyone else had to endure the cost of purchasing a whole new wardrobe. I don’t understand how companies haven’t outgrown this stuff yet. It’s gotten bad where I work. When I started the dress code basically was wear pants/dress and a shirt. Then after a few complaints about a couple of people who pushed the edge on alternative dressing, Upper Management assigned one very overloaded middle manager the duty of writing a comprehensive dress code. Thinking he was going to kill this stupidity, he simply copied the most Brobdingnagian dress code he could find online. It backfired with full adoption and additions. We actually have rules about underwear now. Ah, the old ‘dress to rule’ shenanigans. Guess Biff is passive-aggressive. Dress code here is pretty sane. Individuals who push it are dealt with as individuals. Then I’m glad it isn’t you who writes the dress code for the NCIS. Well, at least not in the TV series, that is. Hal always tells me “Dress for Success!” I _have_ success. I dress for comfort, and ElectroStatic Discharge (in cotton)! What a strange water cooler…. almost vaguely rocket-like in lower half, no? When Biff is around, things just naturally start taking a gradual rocket shape.